Lake Cumberland, named by Dr. Thomas Walker in 1750 for the Duke of Cumberland, son of the King, is the third largest lake in Kentucky. It officially became a lake when Wolf Creek Dam, the 25th largest in America, was constructed in 1950. To create the lake required moving the entire town of Burnside, Kentucky (the birthplace of the Boy Scouts of America, although the title is occasionally disputed by a few other towns) to higher ground and destroyed the town of Rowena entirely. At the same time Wolf Creek Dam was built, the large parcel of land around Lake Cumberland was given to the state of Kentucky by the U.S. government to be turned into a state park. After being granted the land, construction began on a lodge for the grounds featuring 15 rooms, a large dining room and an entrance lounge. It was original called Lure Lodge, a play on the fantastic fishing available at the lake, but was changed to Pumpkin Creek Lodge when it was renovated in 1962. A new and improved Lure Lodge with 63 rooms, restaurant and gift shop was built shortly after. Lodges not really your thing? Lake Cumberland also has several cabins available and plenty of campsites. They also have my favorite kind of lodging available – houseboats. Yes, houseboats. 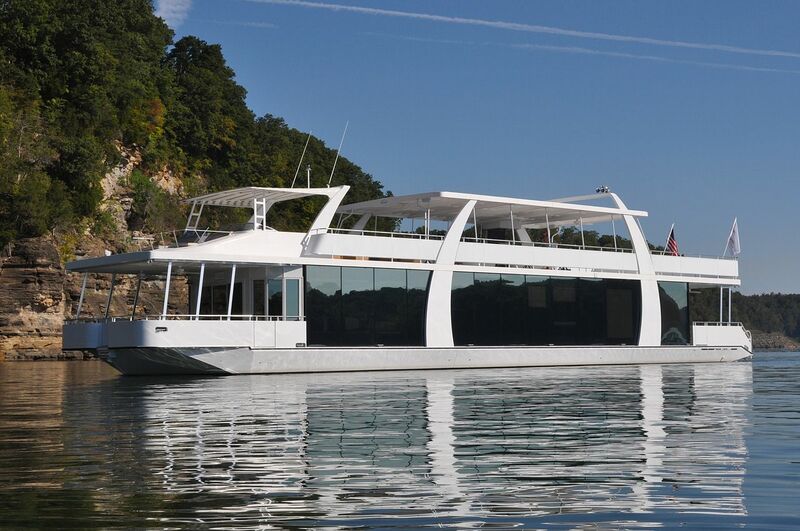 In fact, Lake Cumberland claims to be the “Houseboat Capital of the World.” Even if you have no experience sailing, you can be quickly taught and then let loose on the lake to enjoy your vacation. If houseboats don’t capture your attention but you’re still craving some water fun, you can rent fishing boats, pontoon boats and ski boats to explore the lake. Repairs were recently made to the Dam that raised the water level considerably, making water sports like skiing and tubing even more exciting. How fantastic is the fishing there, you may wonder? Lake Cumberland actually boasts several of Kentucky’s record sized fish including a 58 pound striped bass, 36 pound sturgeon and 21 pound walleye to name a few. This isn’t surprising considering there are more than 52,000 acres of water in the lake and 1,225 miles of shoreline to fish from. If the water altogether isn’t your idea of a good time, you can attend a wide variety of lectures about native plants, animals and local history from the on-staff naturalist. There is even a recreations staff during the summer, employed solely to cook up exciting activities for visitors. Currently, the lands feature a large number of exciting activities for visitors, including golfing, miniature golf, riding stables, tennis courts, playgrounds, docks, swimming pools and even a disc golf course. Disk golf is very similar to regular golf except it is played with a flying disc or a Frisbee. The goal is the same – to get the Frisbee in the basket in a certain number of throws, with the same sort of challenges as golf. Instead of trying not to drive the ball into the trees, try not to get your Frisbee stuck in it. It is really a blast for all ages. Looking for something a little classier? A short distance from Lake Cumberland, you can visit two different wineries Sinking Valley Winery and Cedar Creek Vineyards. Sinking Valley is named for the nearby sinkholes and caves that the winery overlooks and features a great red wine called Prohibition Repeal Red. Cedar Creek Vineyards is a great little winery with terrific eco-friendly and sustainability practices…and they have a Scottish Highlander cow. It’s adorable. So what are you waiting for? Load your family up into a houseboat, pick up a bottle of Prohibition Repeal Red, and head out to Lake Cumberland for an unforgettable family vacation – complete with disc golf! Mel blogs at brokeGIRLrich where she explores topics like how to not panic over adulthood, working in the arts, and retirement strategies that don’t involve living in a cardboard box under an overpass. She used to travel the world on a boat, but that got boring so she joined the circus and wandered America for a year instead. I know, right? The only place I’d thought of vacationing on a houseboat before was in Amsterdam and that’s an entirely different sort of house boat. These look awesome! I grew up not far from there and have very fond memories of my first summer camp experience on Lake Cumberland. I think it’s a great place to take kids, at least I had a blast when I was one. Lake Cumberland looks lovely! I can understand that it’s easy to have a good time with such scenic views! That is really great! For sure lots of people will visit Lake Cumberland and that’s so nice that they also offers land activities!